Have you recently suffered a broken collarbone (also sometimes referred to as the clavicle bone) in an accident that wasn’t your fault? Then you could be entitled to a broken collarbone compensation payout. 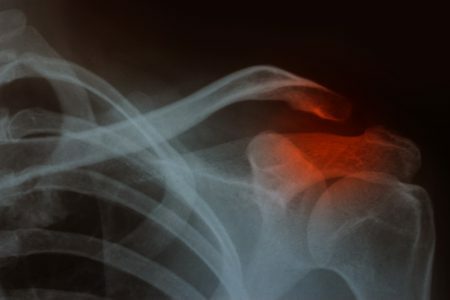 Under what circumstances could you be entitled to claim compensation for a broken collarbone injury? Under UK Law, if you are involved in an accident caused, or made more likely, by the negligent behaviour of another party, then you have a right to make a compensation claim for an injury, such as a broken clavicle. How much can a broken clavicle settlement be worth? Depending on the circumstances you could be owed a large amount in compensation you for your pain, suffering, and the loss of amenity, as well as any loss of income if you had to take time off work, medical expenses and other injuries you incurred. Make sure you use the best personal injury solicitor to make your accident claim. Choose Legal Expert to help you. We are a trusted Legal Advisor, who will match you with the solicitor who has the best expertise to handle your case. Call Legal Expert now for your free consultation with one of our advisors. We will determine whether or not your claim is legitimate, how much money you could claim in your broken clavicle settlement and we can match you to a solicitor who can get you the maximum amount of money for your claim. Call Legal Expert now on 0800 073 8804 to start your compensation claim today. In this case study, we are going to look at the personal injury accident claim made by Miss B, as we have named her for privacy reasons. Miss B is a member of British Cycling and as you can imagine, is a keen cyclist. In 2008, she was cycling down Queensbury High Street, in Bradford, when a driver who was travelling in the opposite direction, turned their car across her path. Miss B lost control of her bicycle and hit the pavement. How Common are Cycling Accidents? Cyclists are sadly relatively vulnerable road users. Unlike people on cars and buses, their vehicle doesn’t have an outer casing to protect them. According to RoSPA, in 2016 102 cyclists were killed on the road, and 3,397 cyclists were seriously injured. Car, van, lorry, and bus drivers are responsible for taking extra care to ensure they do not endanger drivers when cycling near them on the road. After being taken to a hospital, Miss B was diagnosed with having suffered a broken collarbone and soft tissue injuries. The collarbone, also known as the clavicle is a long slender bone that runs across the top of your chest. A broken collarbone can cause severe pain and causes the shoulder to droop as it is no longer supported. Only severe broken clavicle injuries require surgery, most of them heal on their own but require a sling to be worn, to hold it in position whilst healing. The driver’s insurers admitted liability. Miss B legal team were able to negotiate a broken clavicle settlement. The case was also further supported by British cycling. In 2010 Miss B was awarded £6,1000 compensation in her broken clavicle settlement. The compensation was paid on account of her injuries. Many of the personal injury solicitors that we work with offer a Conditional Fee Arrangement (CFA). This is also known as a no win no fee service. This means that you only have to pay the solicitor’s fees if you win your case. For many people no win no fee solicitors services are a less stressful option as you don’t have to take the financial risk of paying an upfront fee. We also understand that if you are taking out a broken collarbone accident claim, you may have had to take time off work – which could have temporarily reduced your income, and may have incurred medical expenses. Therefore, you may be reluctant to put up more money, if you are not guaranteed to get a broken collarbone compensation payout. Choose a no win no fee solicitor, to reduce the financial risk. Begin your no win no fee broken collarbone accident claim today. Call Legal Expert today on 0800 073 8804 for your free legal consultation. Make a claim for a broken clavicle and get the broken collarbone compensation payout you are owed, today. If you were injured in an accident that wasn’t your fault, then you could be owed thousands of pounds in personal injury compensation. Whether the accident happened in a public place like a shop or restaurant, it was an accident at work, or a road traffic accident, you could make a legitimate compensation claim. You must be able to prove that the accident was made more likely to happen, or caused by the negligent actions of another party. This could include anything from ignoring a hazard on the shop floor, failing to provide you with a safe working environment, or dangerous driving. If you think you could be entitled to claim for a broken clavicle, then call Legal Expert today on 0800 073 8804. Our friendly advisors will give you a free consultation, where we will determine whether or not you can legitimately claim for a broken collarbone payout, advise you on how much your broken clavicle settlement may be worth and match you to the best solicitor to handle your broken collarbone accident claim. So call us today, to begin your accident claim. The NHS guide to the symptoms of treating a broken collarbone and how to treat it. How Much Compensation Can I Claim For Cycling Accident Claims? Help and advice for claimants involved in a cycling accident. Legal Expert will advise you on how to claim compensation for a cycling accident that wasn’t your fault.